Government fines against U.S. banks are a tax on the lenders’ excess profits, a former Bank of America executive said Wednesday. Her comments followed an announcement Tuesday that JPMorgan Chase & Co. reached a $13 billion settlement with the U.S. Justice Department over the bank’s sale of mortgage bonds that officials said contributed to the financial crisis. The fine is the latest effort by government officials to penalize banks as they probe lenders’ behavior leading up to the financial crisis. According to Bloomberg, the six biggest U.S. lenders, including Bank of America, have piled up more than $100 billion in legal costs since the crisis, including settlements and lawyers’ fees. 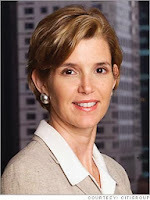 Krawcheck called the JPMorgan penalty, which officials said is the largest settlement with a single entity in U.S. history, not just a “fine for some alleged wrong doing in the past.” She said such fines also hamper banks' returns on investment by shareholders. “It really does raise the question of what is the underlying earnings power of these banks going forward," she said. Krawcheck was forced out of Bank of America in 2011 when her position was eliminated during a restructuring. She now owns 85 Broads, a Connecticut-based networking organization for women professionals. Bank of America Chief Financial Officer Bruce Thompson was the top paid among his counterparts at the nation's largest banks last year, according to a new report from SNL Financial. Thompson brought in more than $11.4 million in total compensation in 2012, the majority coming from a cash bonus and stock awards. That easily edged out the second-highest paid chief financial officer of last year -- JPMorgan Chase's Douglas Braunstein, who made $10.5 million. He's since been named vice chairman. Wells Fargo CFO Tim Sloan came in third, with $9 million in compensation last year. Nationwide, chief financial officer pay is rising quickly. In the last three years, the median salary for all bank CFOs rose 34 percent, to more than $291,000. George Paulin, CEO of the Frederic W. Cook & Co. consulting firm, told SNL that chief financial officers at banks are doing better than their peers at similarly-sized companies in other industries. He attributed that to the complexity of bank regulations and the upward influence of large salaries for the investment bankers and traders below them. Aquesta Bank announced Tuesday that it would award its first cash dividend to investors, and said it hopes to continue to do so each year. The Cornelius-based bank will pay 10 cents per share to stockholders as of Nov. 29. The dividend will be payable Dec. 13. Aquesta said it hopes to pay dividends annually, but would not commit to a particular amount. Aquesta Bank issued its first stock dividend in April, giving 20 percent more shares to existing investors. The bank's shares began trading over the counter last year. The bank earned $409,000 in the third quarter, or 16 cents per share. That was up 30 percent from the year before. “We are very pleased that Aquesta Bank’s operating results have improved to such an extent that our board of directors has chosen to declare a cash dividend," CEO Jim Engel said in a statement. "It is clear that our Board recognizes the importance of rewarding our shareholders for their patience and support during the economic downturn." Aquesta Bank primarily focuses on businesses in the Lake Norman area. Bank of America's share price climbed Monday to a level not seen in nearly three years. Shares of the Charlotte-based bank rose to $15.17 in early afternoon trading, setting a 52-week high. It's the highest price for the shares since they reached $15.31 in January 2011. Shares remain below the $50 range at which they traded in 2006. The bank's share price has been rising all year amid improved earnings. In each quarter this year, the bank's net income has been higher than a year ago. Despite the higher profits, the bank’s potential legal exposure continues to weigh on the minds of some investors. The bank has spent a total of $20.1 billion over the past five years on legal fees and litigation expenses, reports filed with the Federal Reserve show. According to news reports last month, the bank could face a $6 billion settlement from the Federal Housing Finance Agency over mortgage-backed securities sold to Fannie Mae and Freddie Mac. Bank of America's shares closed flat Monday at $14.92. Chanticleer Holdings said Friday it had a bigger net loss in the third quarter compared with a year ago thanks in large part to higher expenses. The Charlotte-based investment company, whose business model includes owning and operating Hooters restaurants outside the U.S., reported a loss of $1.4 million, or 38 cents per share, up from a loss of $740,000, or 20 cents per share, last year. For the most recent quarter, the company said a rise in general, administrative and interest expenses was the primary reason it had a bigger loss than a year ago. Also, revenue declined 7.4 percent to $1.6 million as restaurant sales fell. Chanticleer has seven Hooters locations in four countries: Australia, Hungary, South Africa and the United Kingdom. The company says it needs to increase its number of Hooters locations to overcome the costs of being public and reach profitability. Chanticleer is expanding beyond its focus on Hooters. In October, it bought American Roadside Burgers. Last week, it said it has acquired a majority stake in the companies that own the Charlotte-based Just Fresh restaurant chain. American Roadside and Just Fresh are based in Charlotte. Park Sterling Bank announced Friday that Thomas Parks, who most recently served as a senior vice president at PNC Bank in Raleigh, will be the Charlotte community bank's director of retail branch operations. Parks had previously held executive positions at RBC Bank and Wachovia. Nonprofit microfinance lender Grameen America says it has now lent more than $1 million to 700 women in Charlotte since launching about a year ago. The organization's goal is to help lift low-income women out of poverty through entrepreneurship through loans of about $1,000 to $1,5000. Its branch in Charlotte opened last winter after a years-long campaign from local business leader and city officials. Organizers raised $2.5 million, spurred by a donation from Wells Fargo. Grameen Charlotte have a borrowers holiday market next month at Packard Place to raise more money. It will allow people to buy Christmas presents from some of the Grameen-sponsored entrepreneurs. Tickets will go toward more microloans. VANTAGESOUTH TOPS IN SBA LENDING: The Raleigh-based banking operation says it was North Carolina's top Small Business Administration lender by loan volume, issuing 51 loans totaling $56 million through the program in the 2013 fiscal year. BOFA RELEASES SMALL BUSINESS OWNER REPORT: The highlights -- Small business owner confidence in the economy is improving, but still less than half think the environment will get better next year; more than three quarters say health care costs and government leadership are a concern; less than one-third plan to hire in the next year. Read the full report here. Wells Fargo says it is returning to a building it previously leased in the University City area, in a move that will allow the company to grow existing lines of business in Charlotte. In May, Wells Fargo will move into the University Research Park building at 8740 Research Drive, spokesman Josh Dunn said. Wells Fargo will occupy only a portion of the building initially and add employees as it expands a "wide variety" of businesses, he said. He did not elaborate on the lines of business. Wells Fargo intends to use the space for new hires, he said. The bank does not plan to relocate existing employees in the Charlotte region to the building, he said. “This is an example of Wells Fargo continuing to grow and do business in Charlotte,” he said. He said the bank does not have yet a figure for how many employees might work in the building once it's filled. This year, after its lease expired, Wells Fargo moved employees out of the building and into Innovation Park. Ralph Kittrell, principal with the company that owns the 1980s-era building, said Wells Fargo left it because "the space just needed major work for them to stay there." Kittrell's company, Plymouth Meeting, Pa.-based Exeter Property Group, bought the roughly 160,000-square-foot building in April for $6 million from Raleigh-based Highwoods DLF. Exeter is spending $10 million to $15 million renovating the building, said Kittrell, who described it as "worn out." Renovation work is ongoing. Dunn said the bank had leased space at 8740 Research Drive for approximately 15 years. Kittrell said the lender has agreed to a 10-year lease and will occupy the entire building. Although the bank has announced layoffs in Charlotte in August and September because of declining demand from consumers to refinance mortgages, Wells' employment in the region is holding steady at about 20,700, Dunn said. Truliant Federal Credit Union broke ground on a new branch in Huntersville on Tuesday, which will be its first in northern Mecklenburg County. When it opens in the spring, the branch -- at the corner of Gilead Road and Boren Street near the Earth Fare -- will be Truliant's fourth in the Charlotte area. The Winston-Salem based credit union is most heavily concentrated in the Triad. Truliant now has 180,000 members in 21 branches across the Carolinas and Virginia. Charlotte resident Kira Ortega was visited Tuesday by Carolina Panthers linebacker Luke Kuechly, who helped Bank of America hand over the keys to a home the bank donated to her. For more on the bank's home-donation initiative, click here for a blog post I wrote Saturday. Revenue growth has been tough for banks of all sizes since the financial crisis. But Bank of America CEO Brian Moynihan says getting that growth starts simply: with selling one more product to the millions of customers Bank of America already has. Especially the wealthy ones. The strategy, known in the industry as cross-selling, has been in vogue of late and is most commonly associated with Wells Fargo. But it's also been a theme at Bank of America as it's absorbed investment bank Merrill Lynch. Now Moynihan says it's a priority across the bank: retail, wealth management, commercial, business, investment banking and markets. "It's always about basically focusing on the customer and getting another piece of business from them," he said. Moynihan said a special emphasis has been on wealthy customers. Of the 8 million visits per day Bank of America branches get, about 1 million of those are from the affluent. "You're working them and working them and that's where the growth's going to come from," he said. Corporate America is generally more optimistic, and cash flow is strong. Executives are still a little uneasy, however, about future economic growth. Consumers are spending "at a fairly good clip." Bank of America is bringing in wealth management advisers at a steady rate. Much of that is coming from what's called its "PMD" program, a three-year training progression. The bank has spent about $750 million on mobile development over the past few years. That's paid off with about 6,000 to 7,000 new mobile banking customers per day. About 7 percent of checks Bank of America deposits are now coming through the mobile app. Branches on the whole are getting larger. In Boston, for example, Bank of America has taken four regular branches within a few blocks of each other and combined them into one larger branch with more people of different specialties. However, the bank is also experimenting with "Express" branches, which are smaller and rely heavily on video technology. Bank of America is reportedly in talks with mortgage giant Freddie Mac over a potential settlement that could put an end to the disputes between the two over soured mortgages, the Wall Street Journal reports. Should it come to fruition, it would be the second major accord between the Charlotte bank and the mortgage giant over loans sold to Freddie Mac before the financial crisis. The Journal says the agreement would cover the rest of the loans sold before 2012. The earlier agreement covered loans sold by Countrywide. DELOITTE TEAM IN CHARLOTTE ADVISING ON ENERGY DEAL: The investment banking group is working with energy infrastructure maintenance company Elkhorn Holdings on its sale to the international energy services firm John Wood Group. The Deloitte team is formerly of McColl Partners, which sold earlier this year. YADKIN FINANCIAL EMBLEMATIC OF ANEMIC LOAN GROWTH: The Elkin-based bank told analysts the other day it was on the offensive when it comes to lending, but the results were a little underwhelming -- about 2 percent growth year to date. SNL Financial says that's been typical across the community banking sector. Linked quarter loan growth was just 1.25 percent nationwide in the third quarter, and half that in the South. A Charlotte woman and her son will be given a home donated through a Bank of America initiative to provide properties to injured veterans and first responders, the bank said Saturday. The bank announced the three-year campaign in August 2012. Its goal is to donate 1,000 mortgage-free homes to nonprofits and government programs. On Tuesday, the California-based Nehemiah Community Reinvestment Fund and the bank will present Kira Ortega and her son the keys to a home in Charlotte. The bank said Ortega and her husband, Clint Ruiz, served in the Army and married in 2010. Ruiz died two years later while deployed in Afghanistan. Ortega is working on a degree at Central Piedmont Community College, and the home will provide her with stability to focus more of her attention on her young son, the bank said. The Charlotte-based bank said Saturday that it has donated roughly 800 homes under the program and will reach its goal of 1,000 homes more than a year ahead of schedule. It has donated more than 130 properties in North Carolina, it said. Also Saturday, James Miller, a California Army sergeant, and his family became the latest to receive a home under the program. Miller, 28, was awarded a Purple Heart after being injured in Afghanistan, the bank said. He and his family were given the keys to the house in a surprise event. “This weekend, as Americans pay tribute to those who have served and sacrificed for their country, we are honored to continue our support of veterans and their families through this unique home-donation program,” Ron Sturzenegger, an executive for Bank of America, said in a statement. Two Republican members of Congress who represent the Charlotte area say regulations created after the financial crisis are hurting community banks -- and resulting in fewer of them in North Carolina. Reps. Robert Pittenger and Patrick McHenry, who serve on the House Financial Services Committee, delivered that message this week to a group of bankers during an event at Charlotte City Club in uptown. Pittenger and McHenry said smaller banks have higher compliance costs as a result of new mandates, such as those from the Dodd-Frank Act. They said the added expenses are driving banks to consolidate. "You’re seeing a shrinkage in … community banks," Pittenger said. Pittenger called regulations passed since the crisis "devastating" to community banks. He said it's easier for large banks to afford the higher compliance costs. As smaller banks face the same compliance costs as large ones, "it makes sense to merge," McHenry said. "That way, you can actually deliver returns for your shareholders, your owners." The two lawmakers also said regulations created in the wake of the crisis are hurting banks' abilities to lend. E. Dawn Thompson, associate counsel for the N.C. Bankers Association, who attended the City Club event, told a reporter afterward that the state has roughly 104 banks and other financial institutions, a decline of about 20 over the past 18 months. Consolidations are a big factor, she said. She pointed to Greensboro-based NewBridge Bancorp and Raleigh-based CapStone Bank, which last week announced they plan to merge. The combined bank will go by the NewBridge once the deal closes, which is expected by the first quarter. Pittenger and McHenry have supported legislation, such as House Resolution 922, to roll back parts of Dodd-Frank, a regulatory overhaul passed in 2010 to prevent another financial crisis. Last week, they voted in favor of the resolution, which would allow large banks to handle some derivatives trades in house instead of pushing those activities to separate corporate entities to remove them from federally insured depository institutions. The bill, which was approved in a 292-122 House vote, now heads to the Senate. It would repeal a so-called "push-out" provision created out of Dodd-Frank. McHenry said the bill would change a "poor" rule that resulted from Dodd-Frank. "There are some very basic transactions that a financial institution should be able to keep within their bank, not pushing it out to an affiliate, a nonbank affiliate," he said. Those who oppose the provision say it increases transaction costs passed on to consumers and moves swaps trading out of regulated institutions. Supporters say it prevents banks from engaging in risky trading. According to the website Govtrack, the legislation has a 19 percent chance of being enacted. The U.S. Treasury tried unsuccessfully to end its bailout investment in Gastonia-based AB&T Financial Corp. this week after not enough outside investors were interested in buying it. The government was only able to sell 85 percent of its original Troubled Asset Relief Program preferred stock capital infusion it made in the bank in 2009. AB&T Financial is the parent of Alliance Bank & Trust, which has locations in Gaston and Cleveland counties. And the sales the Treasury were able to make came at a deep discount -- about 25 percent of full value, the government said Friday. Not enough bids came in above the minimum the Treasury had set. The government began its auction of the investment earlier this week. The Treasury has spent the past year and a half trying to quickly unwind the rest of its bailout program. Business Insider came out Friday with a list of teenage investors who are market-smart beyond their years -- and a Charlotte 18-year-old made the cut. Ben C. Banks describes himself as an Eagle Scout, avid runner and "momentum stock" trader. That refers to investors who buy hot stocks and sell them cold. He says his goal is to major in finance and go on to run his own firm. Looks like he's well on his way. While the travails of the federal government's public health insurance exchange have garnered all the headlines, insurance companies' private exchanges have grown rapidly in popularity. BB&T said Thursday that it has jumped into that fray. The Winston-Salem bank said it has in fact launched two private insurance exchanges that let employees choose health, dental, vision, life and disability coverage. The platform has grown more popular as the Affordable Care Act has gone into effect. A number of large companies have shifted their workers to private exchanges and provided a fixed amount of money to help cover their premiums. Consulting firm Accenture says one in five employees in the U.S. could get their insurance through a private exchange in the next four years. Bank of America is in settlement talks with the Consumer Financial Protection Bureau over allegations it deceived customers in the sales of credit-card add-on products, Bloomberg reported Thursday, citing to two people briefed on the talks. A deal is not imminent, as the Charlotte-based bank and the federal agency wrangle over the settlement's terms, the people said. A sticking point, according to one person, is the restitution the bank would pay customers. Reached by the Observer, a spokesman for the bureau declined to confirm whether the agency is negotiating with the bank. In January, a judge approved a $20 million settlement to compensate customers who bought the bank's Credit Protection Plus product. Customers paid monthly fees in exchange for credit card payments being canceled in the event of a job loss or other hardship. The settlement affects customers who claimed, among other things, that they were signed up for the product without their consent or that the product was not as advertised. On Sept. 1, the bank stopped providing the credit protection to those who had still been signed up for it, according to its website. The bank also says it no longer offers an identity theft-protection add-on. In regulatory filings, the bank has said it has been in discussions with regulators over the products. In a filing in August, the bank said it has been in talks with regulators to "address concerns" about the sale and marketing of its credit card debt-cancellation products. In the August filing, the bank said it might be subject to enforcement action and penalties from regulators. It also said it might be required to pay restitution or provide other relief to customers. In another filing a year ago, the bank said regulators were looking at its identity theft-protection services. Issues regulators were interested in include "customers who may have paid for but did not receive certain of such services from third-party vendors" of the bank and "whether appropriate oversight existed." The bank has said it might face enforcement action from regulators and be required to pay penalties and restitution to customers. Bank of America spokeswoman Anne Pace said in an email that the bank has refunded customers who did not receive the full benefits of the identity-theft product. She said the bank stopped marketing the identity-theft services in 2011. She declined to comment on the status of negotiations with the Consumer Financial Protection Bureau. Bank of America is not the only lender to face scrutiny for credit card add-ons. Last year, Capital One Financial Corp. reached a $210 million settlement with the Consumer Financial Protection Bureau and the Office of the Comptroller of the Currency. The two agencies said the products had been sold through "deceptive" marketing. The Capital One case was the first public enforcement action of the bureau, which had been created by the Dodd-Frank Act. Including Bank of America, the bureau's investigation has reached all of the top six credit-card issuers, Bloomberg said. The bureau also reached settlements with American Express Co., Discover Financial Services and JPMorgan Chase & Co. In March, Citigroup said it may face penalties from regulators over the credit card products. Charlotte-based Tree.com was able to turn falling mortgage volume across the financial industry into a revenue boom in the third quarter, the parent company of loan-finding site LendingTree said Thursday. The company reported earning $316,000 from its lead generation business in the quarter, up from $270,000 last year. Tree.com's discontinued operations, primarily a mortgage origination business it sold last year, pushed the company to a loss overall. The company primarily makes money as a lead generation service. Customers use the site to shop for mortgage rates from a number of different banks. The banks pay Tree.com for the referrals they get from the site. When mortgages are harder to come by, banks are willing to pay more for the leads. Revenue from mortgage leads jumped 73 percent in the third quarter from a year ago, the company said. "Despite a significant drop in mortgage originations in the market overall, revenue from our mortgage products held steady and we gained considerable market share in our core business," CEO Doug Lebda said in a statement. The Federal Reserve has ended its 2010 enforcement action against Charlotte-based CommunityOne Bancorp, an emergency measure dating back to the aftermath of the financial crisis. The decision is another milestone in the bank's recovery from the brink of collapse since being propped up in a $310 million capitalization and forced merger with Bank of Granite two years ago. The Fed announced the enforcement action against what was then known as FNB United Corp. in October 2010, as the bank's capital levels plummeted. IT required the bank to stop paying dividends and come up with a plan to boost its financial soundness. Ultimately, the bank accepted a capital infusion from private equity investors, brought in former First Union executives to lead the bank and merged with the Granite Falls-based Bank of Granite in 2011. Both banking subsidiaries, CommunityOne Bank and Bank of Granite, were released from similar consent orders earlier this year. The company changed its name to CommunityOne and moved its headquarters from Asheboro to Charlotte over the summer. The bank returned to profitability in the third quarter. SunTrust Banks has removed its name from automated teller machines at drugstore chain CVS, saying the machines only dispensed cash at a time when customers want to do more complex transactions at ATMs. CVS has 30 locations in the city of Charlotte, according to its website. It was not immediately clear if all of those had ATMs. CVS spokesman Mike DeAngelis said in an email that the ATMs, which are operated by Houston-based Cardtronics, will remain in the drugstores under the Allpoint brand name. He declined to comment further. SunTrust's move comes as banks roll out more high-tech ATMs that allow deposits without envelopes, remember customers' preferences and feature video screens that provide real-time access to tellers in call centers. Hugh Suhr, SunTrust spokesman, said the Atlanta-based bank is seeing rising demand from customers who want to perform complex transactions at ATMs. In response, "we are focusing our resources on our own full-service, remote ATMs, which offer broader capabilities and allow us to serve more of our clients’ needs," he said. SunTrust did not have co-branding ATM arrangements with anyone else, he said. Fifth Third Bank said Wednesday that it has formed a Charlotte-based team of bankers who will cater to the health care industry and its "growing needs." The bank said it is creating the nine-member team at a time when health care providers need to make sure back-office processes and technology meet new regulatory requirements. The providers that the team will focus on include health systems, independent hospitals, managed-care organizations and physician group practices in North and South Carolina and Virginia. The bankers will provide a range of financial services, from lending to cash-flow and asset and liability management. Doug Robertson, who leads the health care team, said in a statement that health care organizations are operating "in unprecedented times, with enormous regulatory pressure" that can affect the quality of their services. Fifth Third will "seek to collaborate with providers to address these issues," he said. Fifth Third is headquartered in Cincinnati. In Mecklenburg County, it is the fourth-largest bank as ranked by deposits and has 21 branches. Bank of America CEO Brian Moynihan said Wednesday that the U.S. housing market is “fairly stable” and recent declines in mortgage refinancing activity are not indicative of the sector's overall strength, The Wall Street Journal reports. Moynihan spoke during an event hosted by the paper. He discussed other topics, including the Charlotte-based bank's legal troubles and consumer spending. Like other banks, Bank of America has seen a slowdown in consumer demand to refinance as mortgage rates have risen this year. The bank, like other lenders, has announced layoffs in connection with the dip in refinancing activity. On a third-quarter earnings call, the bank's chief financial officer said the bank expects to cut more jobs as its refinance business continues to shrink. Moynihan said home purchases, which have risen since the beginning of the year, spur broader economic activity. Despite the recent partial government shutdown, consumer spending has been strong, he said. Regarding the bank's legal woes, Moynihan said it has spent more than $40 billion to clean those up. But the bank still faces a slate of lawsuits and legal claims that could add up to billions more in costs. Last week, the bank disclosed that the U.S. Department of Justice might file a lawsuit over mortgage bonds. Moynihan would not say whether he thinks the government is unfairly “shaking down” large banks by penalizing them for practices that led to the financial crisis. “What’s fair and unfair is a debate I have at 10 o’clock at night by myself,” he said. Charlotte and North Carolina are seeing a resurgence in advanced manufacturing, but such companies are having difficulty in finding skilled workers, the president of the Richmond Federal Reserve Bank said Tuesday during a visit to Charlotte. Unlike manufacturing jobs of the past, the new jobs require more skills and "significant" post-secondary education, Jeffrey Lacker said in a presentation to business leaders at the Federal Reserve branch in uptown. "We hear a lot of manufacturing companies have trouble finding workers," he said. "Machinists are in short supply, welders." Many policymakers have focused on increasing college enrollment, he said. But for some students, "pursuing a bachelor's degree might never be their preferred path," he said, adding that only a little more than half of college students get their bachelor's degree in six years. A better job could be done of making sure high school students are informed about different career opportunities, he said, "including options that don't involve traditional four-year colleges." He cited Apprenticeship 2000, a four-year program that seeks to train workers for skilled jobs in the Charlotte area, as an example of initiatives worth emulating. Lacker said he saw how Apprenticeship 2000 has helped Siemens Energy during a tour of the company's Charlotte operation Monday. Bank of America head of global technology and operations Cathy Bessant has been honored for her work to promote a workplace that is equitable and inclusive for gay, lesbian, bisexual and transgender employees, Out & Equal Workplace Advocates said Monday. The nonprofit organization is dedicated to promoting equality in the workplace for the LGBT community. Bessant's award was given out at the Out & Equal Workplace Summit, which bills itself as the leading LGBT professional development event. Bank of America regularly ranks among the top companies for workplace equality, according to the Human Rights Campaign. Bessant has also been vocal on LGBT issues in North Carolina. She released a video in March 2012 opposing the state's proposed constitutional amendment to ban gay marriage. It ultimately passed. A federal judge has dismissed a case in which shareholders had accused Bank of America of failing to disclose a potential lawsuit eventually brought by mortgage-securities investor American International Group. U.S. District Judge John Koeltl in New York wrote in a decision Friday that the Charlotte-based bank had publicly disclosed the heightened litigation risks it faced because of its acquisitions of Countrywide Financial Corp. and Merrill Lynch. Koeltl also wrote that Bank of America was not obligated to disclose the imminence of the AIG lawsuit because the bank could not be certain about it. The lawsuit was filed in September 2011, just a month after AIG sued the bank over $10 billion in losses it said it suffered on $28 billion invested in mortgage-backed securities. AIG said Bank of America, Countrywide and Merrill Lynch had misrepresented the quality of the mortgages. That lawsuit is pending. In their lawsuit, the shareholders contended that Bank of America knew by at least January 2011 that AIG intended to file a "massive" lawsuit against the bank. But the bank's 2010 annual report submitted to regulators in February 2011 failed to mention the possible AIG lawsuit, "the most significant and largest potential litigation that could be asserted against the company," the shareholders claimed. On the day the lawsuit was filed, Bank of America shares fell 20 percent. It was also the first trading day since Standard & Poor's downgraded U.S. debt, causing the Dow Jones industrials to fall 634.76 points. Koeltl wrote that Bank of America's 2010 report "explicitly discussed BoA’s escalating exposure" to mortgage-backed securities litigation. He added that newspapers were writing about AIG's potential lawsuits against lenders, including Bank of America. "The particulars of the potential AIG suit were known to the market and thus allowed investors to evaluate the defendant’s statements," he wrote. Bank of America spokesman Lawrence Grayson said Monday that the bank was pleased with the court's decision. Bank of America has entered into a settlement with the U.S. Housing and Urban Development over allegations the bank discriminated against pregnant women seeking loans, the government announced Monday. The Charlotte bank will pay $45,000 to resolve claims that two couples who applied for mortgage refinancings in 2011 and 2012 were denied because the women were on maternity leave. The complaints stemmed from San Jose, Calif., and Humble, Texas. The California couple said Bank of America pushed back the refinance closing date because of the maternity leave. They will receive $25,000. The Texas couple said the bank wouldn't consider any of the woman's income because she was on leave. They will get $15,000, and their realtor $5,000. The housing department said Bank of America has made sure its new policies toward considering maternity leave in a loan application do not run afoul of discrimination guidelines. “No lender should use a woman’s pregnancy or maternity leave as a reason to deny a mortgage loan,” acting assistant secretary for fair housing and equal opportunity Bryan Greene said in a statement. “We commend Bank of America for working cooperatively with the Department of Housing and Urban Development in reaching appropriate resolutions of these complaints." Bank of America has already settled claims it discriminated against disabled homebuyers with the housing department. Bank of America has long had a strong commitment to treating all applicants fairly, including women on maternity leave. For many years, Bank of America’s policies have expressly allowed applicants on parental leave to be approved for a loan without returning to work. Bank of America disagrees with the allegations in each of the complaints, and HUD has not alleged that Bank of America engaged in any wrongdoing. We elected to resolve these complaints on a voluntary basis in order to address customer service concerns and avoid further legal expenses. The policy changes that the Bank agreed to in these settlements amounted to clarifications of existing language, including some changes that required the approval of other government agencies. The U.S. Treasury plans to auction off the bailout-era investment it made in Gastonia-based AB&T Financial, a sale that would make the company one of the final Charlotte-area banks to exit the program. The parent company of Alliance Bank and Trust received $4 million in preferred stock from the government as part of the Troubled Asset Relief Program in early 2009. Over the past year and a half, the Treasury has sought to unwind its investments in community banks across the country -- many through auctions. The auction is scheduled to begin Monday and end Thursday. Provident Community Bancshares, based in Rock Hill, still has a $9 million investment from the Treasury on its books, according to Keefe, Bruyette and Woods. Bank of America will process the electronic payments for the state of North Carolina for the next five years after winning a contract with the state treasurer and controller last week. The contract covers payments like employee direct deposit paychecks, vendor payments and tax collections. Bank of America will charge less than half a penny per payment, a new rate which the state says will save taxpayers $1 million. The state budgeted about $21.7 million for e-commerce this year. The state Department of Revenue is one of the biggest users of electronic payments. All state agencies, towns, colleges, schools and local governments will be able to access the system as well. Charlotte Metro Credit Union employees are wishing their boss a happy anniversary Friday. Long-time CEO Bob Bruns has just hit his 30th year with the financial institution. A Chicago native, Bruns started his career as a North Carolina bank examiner after graduating from Western Carolina University. He joined Charlotte Metro in the top spot in 1983 at age 27. Over the summer, Charlotte Metro crossed $300 million in assets, ranking it as a mid-size institution. That's more than 10 times the size it was two decades ago. Two well-known investment banking executives have joined Babson Capital's division that provides financing to middle-market companies. Eric Lloyd, the former head of market and institutional risk for Wells Fargo and a member of the bank's management committee, will now be Babson Capital Finance's capital markets leader. Lloyd had previously been chief risk officer of Wells Fargo Securities. He had been one of Wells Fargo's top-ranking executives in Charlotte. Also joining Babson is Terry Harris, formerly managing partner and co-founder of Certus Capital Partners. He'll be Babson Capital Finance's head of portfolio management. “These seasoned industry veterans will play critical roles as we continue to expand our capabilities and build Babson Capital Finance into a leading global finance company serving middle-market companies worldwide," Mike Hermsen, CEO of Babson Capital Finance, said in a statement.